For a long time this land nas called Szwajcaria Kaszubska (Kashubian Switzerland”. There are two geographical concepts, Paris and Switzerland, which have always been favourite borrowings adopted by diverse countries and citieson grounds of real or imagined resemblance. This is what happened in Kashubia (or Cassubia ) as well. Centuries ago someone felt authorised, thanks to the local mountains (or rather hills ) and lakes (small or medium – sized, except for Lake Wdzydze ), to invoke the Swiss analogy. In one sense the holds true. Kashubia has a beautiful countryside, with the added ornamentation of diverse historic sights – castles, churches, monasteries. Between the World Wars Kashubia was part of Poland. For coenturies the border – Teutonic, Prussian, or German – ran not far from here, but this land was unfalteringly Polish. Curiously enough, no fortresses were built here. The dense forests and deep waters were avoided by the trade routes, too. So the Kashubes lived here effectively in isolation, left to themselves, their culture, language, and customs, wchich perhaps go back to Gothic times. So this is a different, unusual land. And what about the Kashubes themselves? Many scholars have tried to answer that question, observing the differences marking its half-a-million population, its folklore, dialect and customs off from the rest of Poland. One theory claims that Kashubian is a half-way stage between Polish and the extinct languages of the Ranowie, Obodryci, and Drzewianie tribes. 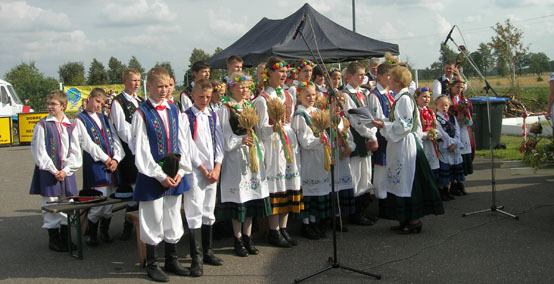 Linguists classify Kashubian as belonging to the Lechitic group of the Slavonic languanges. At any rate, other Poles find it hard to understand the Kashubes. Not only are the words different (hence the Polish-Kashubian dictionaries ), but also the phonetics of Kashubian are surprisingly archaic. The Kashubes are very proud of their tongue, but generally they consider themselves Polish. “There is no Cassubia without Polonia, and no Poland without Kashubia,”as the Kashubian poet Hieronim Derdowski wrote in a dedication to the Polish novelist J. I. Kraszewski. Kashubian is in a way a living museum. Books, even the New Testament, are being published in this laguage. But there is no dearth of other museums of culture between the ports of Puck and Wejherowo, and the Tucholskie Forests. 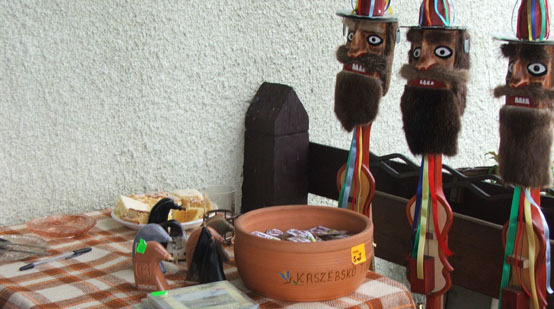 The main one is the Kashubian Ethnographic Park at Wdzydze Kiszewskie, where you can admire the pottery, amberware, folk embroidery, and other arts and crafts, or in short – enjoy the Kashubian atmosphere to the full. Nearby there are threecastles: at Bytów, łapalice and Kiszewo. Bytów Castle, a huge Gothic edifice built by the Teutonic Knights, is a remarkable sight. It’s said to be haunted: knights of old roam its corridors and chamberts; you might hear the clanking of armour. You will definitely see the remains of the old moat and fortifications around the Castle, and a genuinely medieval atmosphere in the narrow streets of the town. There are two historic churches: St. Catherine’s and St George’s; and a 19th – century railway bridge with ornamental coats-of-arms. No train ever crossed it, because the line was moved a little further south after a crossing was built over the river. Not far from Bytów there is another historic site worth visiting at Węsiory – one of the most ancient in Poland. It’s a Gothic place of worship dating back to the 1st century AD. Along the banks of the beautiful Lake Długie you can admire the stone circles and mysterious barrows. Łapalice offers a different sort of architectural curio. An ambitious craftsman of Gdańsk decided to erect a huge castle with twelve bastions, and desiqned it himself. He started building in ... 1979, but after a decade ran intofinancial problems and gave up, leaving a rather amusing folly. Finally there is Kartuzy, Kashubia’s unofficial capital. It has a 14th – century collegiate church with a copper roof reminiscent of a coffin lid – a deliberate idea, just in case someone should forget about memento mori. After all, this is a Carthusian foundation, and that Order always lived in close contact with death. There are also Chmielno, Brodnica, Wieżyca, and many other places to see. At every ster you’ll see that Kashubia is different from the rest of Poland. Apparently even at the Kashubian Grammar School in Brusy, where the school – leaving examination is conducted in Kashubian the chief addictive substance is not some weird marihuana, but good old Polish tabaka (snuff), which the Kashubes still regularly take, sniffing at life’s adversities. There has been no want of adversity. But “the Kashubes will never be brought down,” as the already – cited, late 19th – century Kashubian poet Hieronim Derdowski wrote, and was certainly not wrong.